Grizzly bear cub, Yukon Territory, Canada. Well, I made it. Many, many miles of sitting behind my steering wheel finally got me up to Alaska. And whata gorgeous day it is to arrive. This morning, as I made my way through the final couple hundred miles of the Yukon Territory, I saw moose, tundra swans, grizzly bears and a coyote. I managed to take a few images of the coyote, and also the bears as they grazed on the wildflowers and grasses. I saw a number of black bears in western and northern BC, but no grizzlies. Grizzlies are SO cool, it’s always a treat to see them, and another to photograph them. This family of bears allowed me to be pretty close to them, and I shot this photo with my 70-200mm lens, pointed out the window of my truck. I found if I moved slowly, kept noise to a minimum, and didn’t do anything stupid, the bears were reasonably calm the whole time. Other motorists would drive up, screech to a halt, turn off their engine, restart it and drive closer still, turn it off again, excitedly stick their cameras out the window, beep their horns, holler at the bear and generally make a nuisance of themselves tended to keep the bears anxious. Soon enough, they (the bears) made their way off into the woods for some peace and quiet – I would’ve too, but there’s bears in them thar woods. So now I’m in Alaska, in the tiny town of Tok, not far from the northern entrance to Wrangell – St. Elias National Park. I’m super excited to be back in Alaska, and even more so to get back to Wrangell – St. Elias National Park again and dig into my project. First, I think I’ll have a bite of lunch, catch on some emails, stretch my legs, and grab another cup of coffee. This entry was posted in Alaska, Canada, Grizzly Bears, Photography, Travel, Wildlife, Wrangell - St. Elias National Park, Yukon Territory on June 25, 2007 by Carl D.
Delighted you made it to Alaska – I’m glad I taught you to drive safely and to be sensible around grizzly bears (or grumpy bears as our granddaughter, Lilly, calls them). 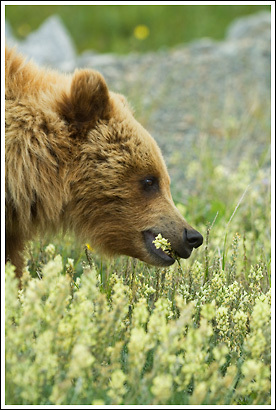 Sounds as though you saw a few wild animals on your way and on your arrival in Alaska. Make sure there’s still some around for when your mother and I arrive (no mention of any kangaroos though). Try and keep some of that nice weather for our trip too. Nice to hear from you, as always. I was beginning to think the storms in your area must’ve eliminated all internet access or something similar. Couple of comments: i don’t recall you teaching me to drive. Did you? I’m sure we’ll see plenty of wildlife when you’re up here. On the weather, I won’t make any promises. I’m glad you’re both excited to come over – you’ll love it. I’m really looking forward to showing you both this part of the world. Try to keep mum out of the stores, for a day or so, at least. As for finalising the details ASAP, you don’t know much about the way i travel, do you? You’ll laugh, I saw a place the other day called the “grumpy bear inn’ or something like that. I immediately thought of Lilly. Well, I better get on here and get some work done, then head out again to hopefulyl catch some evening light. See you both in the fall.